To complement our main warehouse we offer a sample service that not only caters for products stored in our warehouse but right through to crated or palletised equipment. Using IATA (International Air Transportation Association) trained staff and Heppa filtered down flow booths we can extract your sample and prepare for onward shipping. Hanson Logistics sample service has a dedicated administration team for the sample department. We have recently invested in a market leading computer system that allows us to manage stock inventory from expiry dates to batch specific orders. 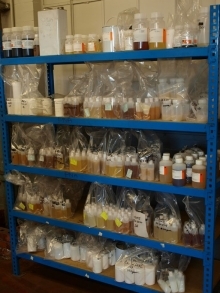 We constantly monitor stock levels and reorder when required within your set parameters, we also have a range of sample containers to suit most needs and shipping regulations but can if required source specialised packing for your products through our vast network of approved suppliers. With over a decade of sample activity from our base at Huddersfield we have despatched hundreds of thousands of samples to both domestic and international locations. We understand that you never get a second chance to make a good first impression and it’s the first impression that counts. So whether you have a hazardous/non hazardous liquid or powder product that requires sampling feel free to talk to us and see how our service can help your business move forward.